"My boyfriend Nathan paid for half of this bulletproof vest. It's supposed to be like top of the line. He picked it out. I think it was very thoughtful of him. I think it shows how much he cares about me." When stripped down to its most basic state, reality television is nothing more than people trying to win money by doing things not seen in everyday life. They eats rats, are videotaped twenty four hours a day, and are tempted to cheat on their significant others. OK, so maybe there are some things that do happen daily. What is most amazing is the lengths to which these contestants will go to obtain whatever prize they are striving for. If ever there were a subject ripe for skewering, reality television is most certainly it. In development long before the recent popularity of shows like Survivor or Temptation Island, director Daniel Minahan's Series 7: The Contenders is a satirical look at reality television from a different vantage point. Instead of competing for money or food, the contestants in Series 7 are fighting for their lives. The way it works is simple. Numbers are assigned to people in a populated area and at the end of each season of the immensely popular program, "The Contenders", six new contenders are chosen for the latest season. Without warning, each contender receives a visit from the creators of the show and are each given a gun. From that moment on, each contender is followed by a camera crew until his or her life is ended by another contender. The current season has an eclectic group of contestants. Dawn (Smith), reigning contender and expectant mother is returning to her hometown to play the new season. Lindsay (Wever), an eighteen-year-old high school student whose parents are more enthusiastic about her work on the show than she is. Bob (Kaycheck) is unemployed with a failing marriage and children to support. Connie (Burke) is seemingly the most prim and proper, though her job in the ER sheds light on her performing several mercy crimes for dying patients. Franklin (Venture), a retiree with little interest in the show nonetheless proves to be a dangerous foe. And finally there is Jeff (Fitzgerald), a struggling artist suffering from testicular cancer, who also happens to be a former love interest of Dawn, our reigning champ. At first glance the subject matter of Series 7 may be a bit off-putting for some. The idea of a televised challenge in which the contestants fight to the death is, I will admit, somewhat horrifying in the way that it shows people doing the worst things imaginable to win fame and prizes. Yet Minahan concocts a story that is rich in its parody of the subject matter, and as Rolling Stone critic Peter Travers claimed, "It plays like Network meets Dr. Strangelove". Presented as a marathon three-episode broadcast, Series 7 wisely tells its entire story as if the audience were watching episodes of the show, with no commercial breaks or off camera interviews. This presents a problem for the film though, as there is little time for character development; the storylines never pause long enough for the viewer to care about the players. Though the lack of development can be ignored for the first half of the film, the final act love story would have worked much better if we felt attached to them in some way. There are, however, several clips shown after each kill that focus on the contestant and their backstory, just not enough to offer any insight into their lives. With a cast comprised of largely unknown actors it is a pleasure to see that the performances in Series 7 are as terrific as they are. As Dawn, Brooke Smith (who was terrific in Vanya on 42nd Street) offers a multi-layered performance that is perhaps the most underrated of 2001. Smith is proves that she is as capable with comedy as she is with dramatic tones; she is undoubtedly the stand out of the cast. 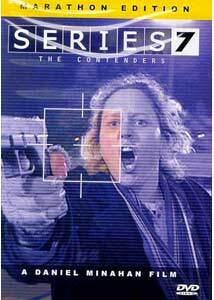 Aside from several small problems, Series 7 is a largely successful film. I enjoyed the way in which it plays with our perceptions of reality programming and dares to ask if the next logical step for television reality shows is, in fact, death. Minahan expertly blends all of this together in a tightly-paced film that never lets up until the third act. Many have criticized it for being a one joke film and that the joke goes on for way too long. I think they are missing the point: Series 7 is a satire that has a lot to say about fame, television and the evils they create. Image Transfer Review: The anamorphic widescreen 1.85: transfer is a virtually flawless presentation. This comes as no surprise, as the film was shot on digital video, allowing for a crisp transfer on the DVD format. Colors are well-rendered with no bleeding, while black levels are deep with little grain. The transfer does appear soft at times, but for the most part the images are crisp and of the highest quality. Audio Transfer Review: The Dolby Digital 5.1 mix for Series 7 is surprisingly active at times, though for the most part it is largely dialogue-driven. The surround speakers come alive during the numerous promo spots, with music and effects filling the room. In the scenes that center on the show, dialogue sounds clean and crisp with little distortion. A Dolby Surround tracks is also provided and for those wishing to relive the film as if it were a television show, this is a good option. Extras Review: Loaded with extra content, Series 7 is the most recent disc I can remember to actually make terrific use of the special edition banner. Leading things off is a screen specific commentary track by director Daniel Minahan. Minahan is very well spoken and has a terrific love for his film, most evident as he talks about both his cast and crew. At the start of the track, he goes into detail about the early stages of the film and his failed attempts at pitching the concept as an "actual" fake television show. His comments about the executives that wanted the show to be "more like Ally McBeal" are hilarious. For fans of the film, this commentary track is a must. The Sundance Filmmaker's Lab is a twelve-minute clip in which Minahan outlines what occurs when a director is allowed into this very prestigious workshop. We see Brooke Smith, as well as other unnamed actors, acting out various scenes from the film. Though little from the scenes is actually heard, Minahan does a nice job of commentating the process. Nine deleted scenes are presented in non-anamorphic widescreen, though the widescreen image is shown inside of a windowboxed frame. Most of these scenes were rightfully excised from the final cut, though several featuring Franklin, I feel, would have helped to know more about his character; as it stands, he is the least seen "contender". Most fascinating are the cast and crew filmographies, each of which is a voice interview with the cast and crew members, rather than text screens. Sparing no expense, the section features everyone from lead actors to the person who painted the paintings showcased by Jeff in the movie. I greatly enjoyed this way of presenting filmographies. Extreme Promotion is perhaps the most abundant area of the disc as it houses several interesting extra features. First are two theatrical trailers, as well as one international promo that, while interesting, simply feel like trimmed down versions of one another. A single TV spot, as well as a minute-long radio spot are provided, as are twenty four production stills. This brings us to Flyers a short clip shot in New York upon the opening of Series 7. Here we see Brooke Smith and Minahan standing in front of a Manhattan movie theater attempting to persuade people to go see their film. It is refreshing to see filmmakers going above and beyond to get the word out about their work. Also included are several easter eggs made apparent by the packaging. I have only found one as of this writing. Burdened by a limited release in the spring of 2001, Series 7 never seemed to find its audience. Those lucky enough to have seen the film theatrically found a hidden gem of sorts, a movie that combines biting humor with some heart-pounding action. On DVD, the film plays better than it did in the theater, giving the pseudo-television appearance more depth and believability. Highly Recommended.